The final tally done by secret ballot was 14 votes in favor, 13 votes against and one abstention, plus two “community votes” against the measure. The motion for a secret ballot, despite its passage, violated the Student Assembly’s bylaws, which “dictate that secret ballots may only be used during executive meetings,” reported The Cornell Daily Sun. The “community vote,” which couldn’t be split, was 248 in favor, 330 against and four abstentions. NetIDs, which is an electronic individual identifier for Cornell members, were used to check eligibility. A motion by a pro-BDS representative, senior Omar Din, to remove the two community votes was rejected by the student government. Another resolution co-sponsor, senior Mahfuza Shovik, disparaged the anti-BDS crowd. However, S.A. vice president for external affairs condemned the anti-Israel measure. StandWithUs and the AMCHA Initiative applauded the outcome. “With this vote, the Student Assembly ensured that would not further divide students for an unjust cause,” said its managing director of campus affairs, Rena Nasar, in a statement. “The victory is a tribute to the sustained, collaborative efforts of students and community members at the university, as evidenced by the two community votes against the resolution, which proved to be decisive in the outcome,” Liel Asulin, campus coordinator for CAMERA on Campus, told JNS. Kidron wrote in the Sun about the experience and warned about the growing ramifications of BDS. 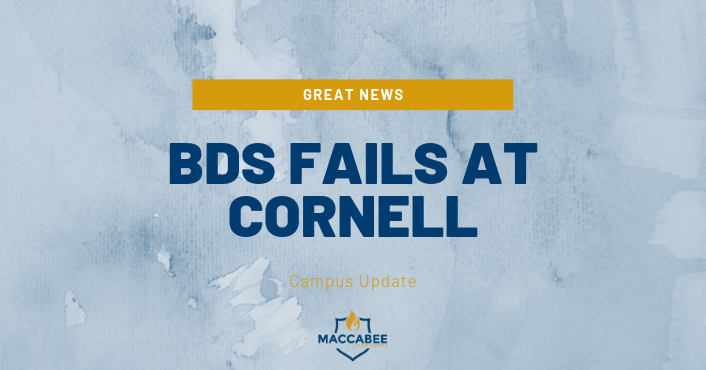 In March, Cornell University president Martha E. Pollack rejected BDS.